During the rainy season, when the fields are awash with rainwater and there is no dearth of water, there are fishes everywhere – of all sizes and all tastes. The people in Terai are seen busy catching fishes through all sorts of traditional equipment – fishing rods, fishing nets, chachh, dhasha and konia which are traditional fish traps laid on the flowing waters between two adjacent fields. The dhasha is the most popular equipment to trap fishes between the flowing waters in paddy fields. It is made of bamboo culms or jute twigs woven together and as the water flows from one field to another field the fishes are trapped in it. The fresh fishes are eaten and the remaining are dried to make sukthi, dried fish to be used during the winter and other seasons. The dried fishes and dried vegetables are saved for times when it is difficult to get fresh fish and vegetables. The Dedhna and Ponthi varieties are preferred to prepare sidhara. Both the varieties are found in abundance in the paddy fields and public water sources. The dedhnas are one of the smallest varieties of edible fishes and can be eaten with its tender bones. They vary in sizes between half an inch to one and half inch in length (so the name Dedhna – meaning one and half). The second variety ponthi is a little bit bigger and wider than the Dedhna and it too can be eaten with its bones. Colocasia is found in abundance in the swampy places, ditches and nowadays even cultivated in the kitchen gardens. The leaves are eaten separately and the stems are used either for the sidhara or dried after being cut into small pieces. The dried colocasia is eaten in the winter and rainy seasons when there is dearth of fresh vegetables. The dried fishes, together with the colocasia stem and turmeric powder is ground and made into small cakes. 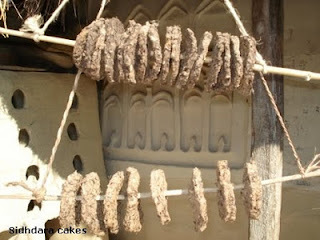 The cakes are left to dry in the sun for 10-15 days and after that it is stored in a dry place for future use. Dried fish is very rich source of protein, containing 80-85% protein. Researches have shown that some compounds in turmeric have anti-fungal and anti-bacterial properties. Besides being used as a colouring agent in key dishes, it enhances the taste and has medicinal properties as well. Colocasia is eaten widely in the Indian subcontinent. The extra additions – green chillies, radish and garlic enhance the taste, reduce the odour and are good for health. The pungent aroma of sidhara is an open invitation to the neighbours to come and join the delicious dish. When the sidhara cake is crushed and fried in mustard oil before adding other ingredients, the acrid smell spreads in the surrounding and the word spreads that sidhara is being cooked. Green chillies, radish, garlic and spices are added to enhance the taste. The mixture is cooked as a curry and is bitter in taste but delicious when eaten with beaten or puffed rice. Next time you visit the Terai, ask for the colocasia concoction and I am sure your taste buds will be delighted to savour the traditional food!